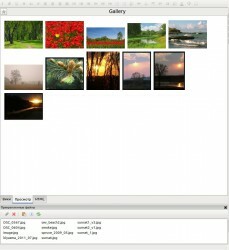 ThumbGallery plugin designed to create galleries of the attached files on wiki pages. cols = ... An integer value. The number of columns in the table. 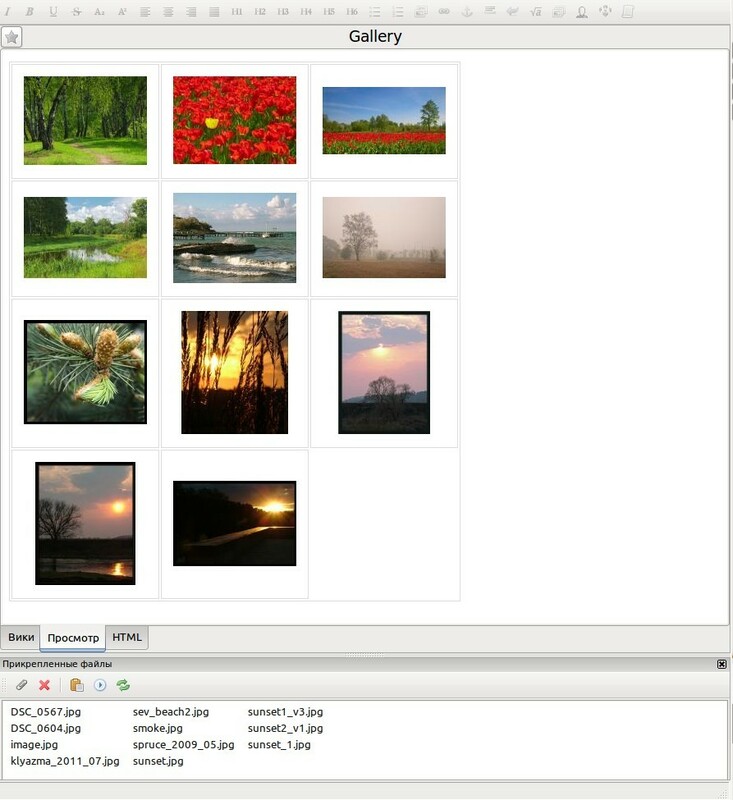 If cols = 0 or not specified, then the gallery will be a sequence of thumbnails without splitting into rows and columns. px = ... An integer value. Specifies the size of the thumbnails (on the larger side). If px = 0, or the parameter is not specified, the default value from the program settings. Possible parameters in this case are the same as described above. Comments on the use of images is not required. Also, do not necessarily write Attach: before the file name. 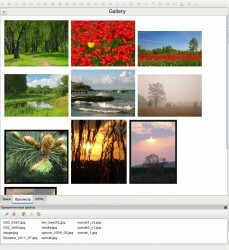 More clearly using the command (: thumbgallery :) will be seen in the following examples. 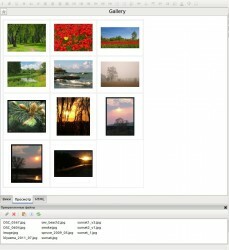 Plugin ThumbGallery created so that where possible, have the syntax compatibility with the plugin ThumbList for pmWiki. 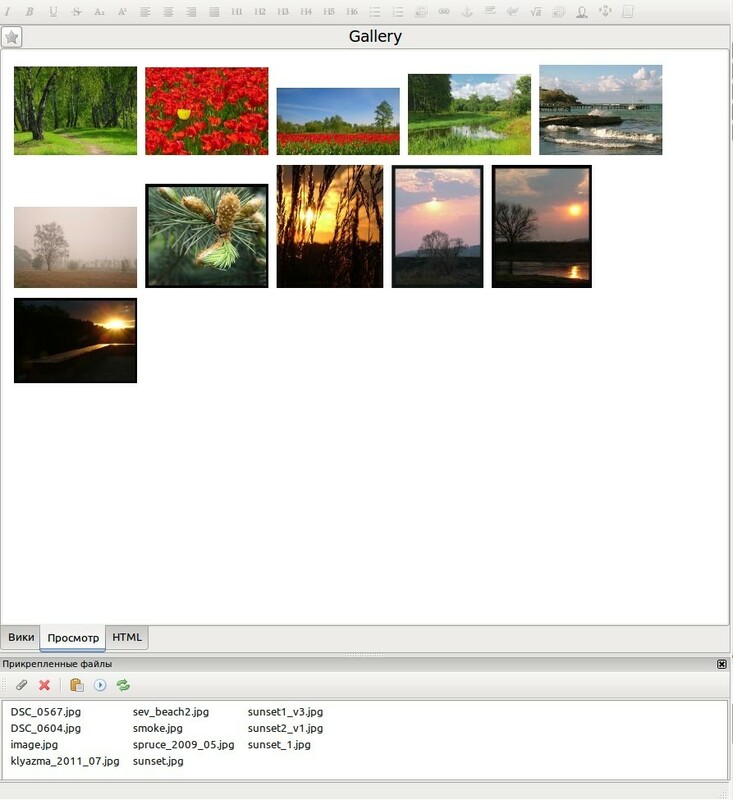 I will not go into details of the plug-in, except to say that it adds two commands (:thumblist:) to create a gallery of all pictures, and (:thumbgallery:) to create a gallery of selected images. As I tried to plugin ThumbGallery combine these commands into one, but added a synonym for the command (:thumbgallery:) - (:thumblist:) . Thus, wherever it is written (:thumbgallery:) you can use (:thumblist:) . I thought that the name of the parameter px not very informative, so I added it a synonym for - maxsize, by analogy with the same parameter when creating a thumbnail. 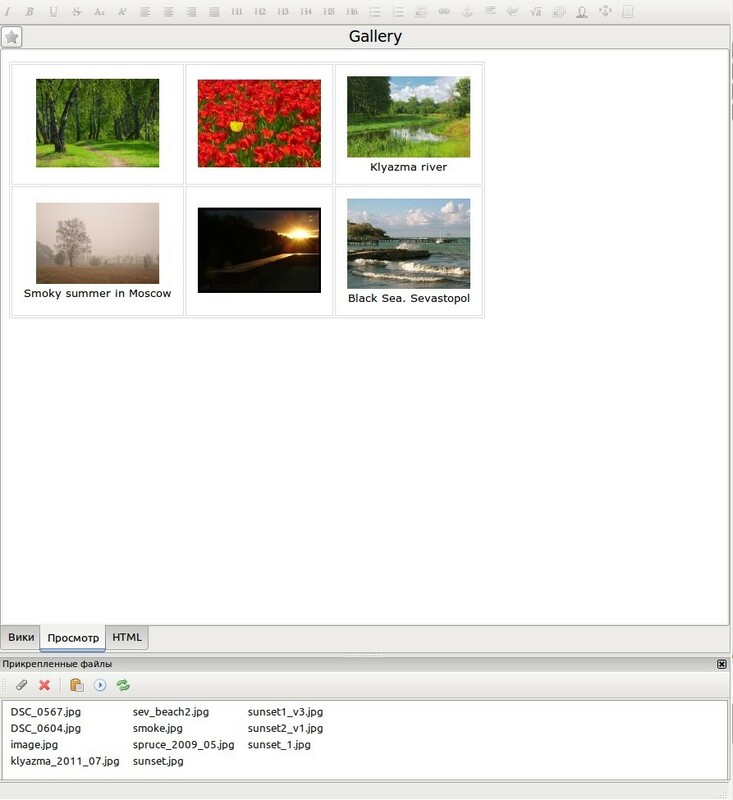 For all galleries uses, non-closable command the notation (:thumblist:) , but for all the galleries with individual images to use the recording (: thumbgallery :) ... (: thumbgalleryend :) . Or vice versa. 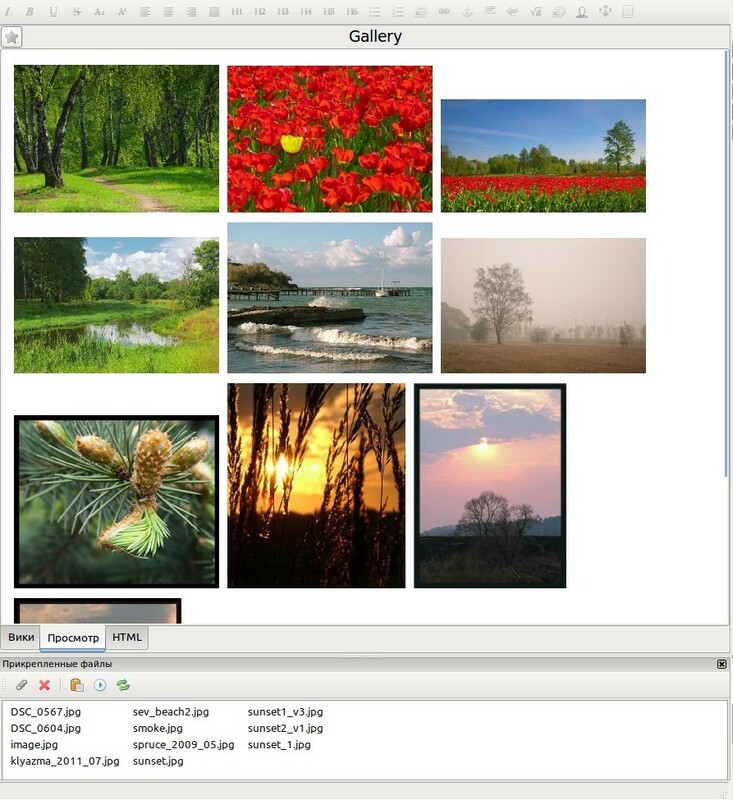 Always use a closing command (:thumbgallery:)(:thumbgalleryend:) . 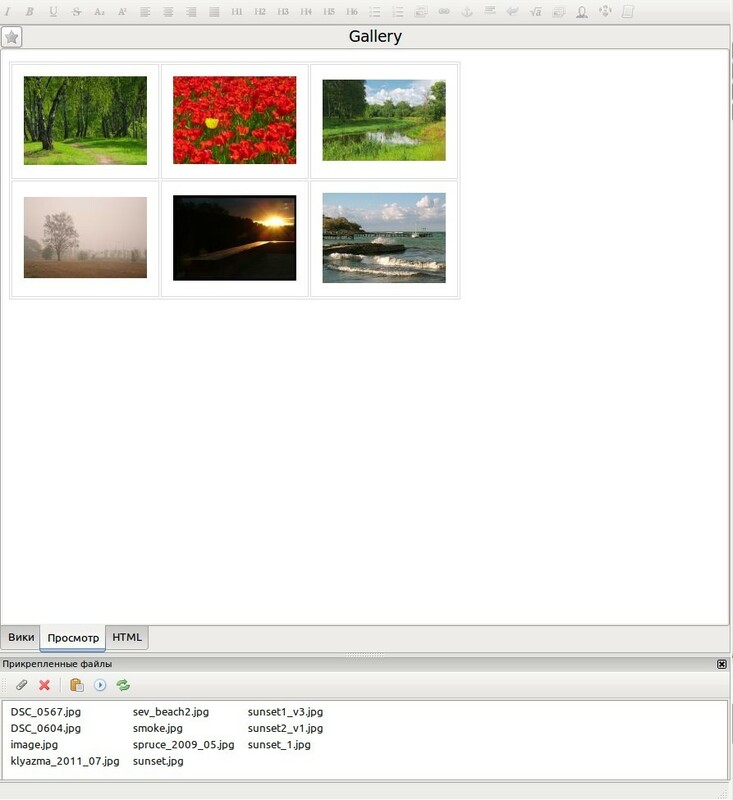 Take care to ensure that between the opening and closing command are no spaces, otherwise it will be seen as creating a gallery with no images. It's not a bug, it was made specifically to be able to hide the gallery if necessary, without removing the entire team. Enjoy the use of plugin! Add OutWiker 2.1 support. Migrate to Python 3.6.